Veneto Sorrento GP LLC has purchased the 236-unit multi-family apartment complex called Casa Sorrento. The 11.40-acre property is located at 3580 E. Alexander Rd. in Las Vegas. The transaction is valued at $13,750,000. Tom Naseef, Jeff Naseef and Garry Cuff of Colliers International represented the seller, Gung Ho – Reliant Casa Sorrento LLC. • Dr. Tahir purchased a 6,454-square-foot office property at 9120 W. Post Rd. in Las Vegas for $709,940. Bridget Richards and Jason Lesley of Colliers International represented the seller, Sunset Post Medical Center LLC. 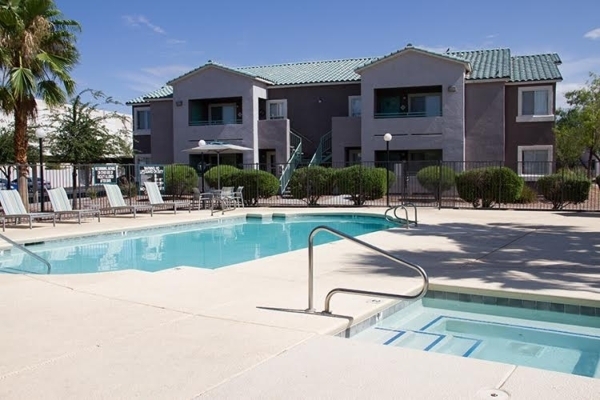 • Ashkelon Investment Corp. purchased a 14-unit multifamily complex at 2417 Wengert Ave. in Las Vegas for $580,000. Tom Naseef, Jeff Naseef and Garry Cuff of Colliers International represented the seller, P. Steiner Holdings LLC. • Reagor Trust LLC purchased a 3,000-square-foot medical office condo in Pageantry Office Park at 2629 W. Horizon Ridge Pkwy., Suites 100 and 110 in Henderson for $375,000. Stacy Scheer of Colliers International represented both the seller, Goldeneye Enterprises LLC, and the buyer. • Marketing Guruss Inc., dba Eyebrows R Us, leased 996 square feet of retail space for 63 months at 4750 W. Sahara Ave, Suite 16, from Sahara 3D LLC. Total consideration was $91,134. Nelson Tressler and Michael Zobrist of Newmark Grubb Knight Frank represented the lessor; Dave Neuenkirch of The Commercial Group represented the lessee. • T&J Beauty Concepts LLC, dba Hue Salon and Spa, leased 2,310 square feet of retail space for 60 months at 4245 S. Grand Canyon Dr, Suite 102, from E-Grand Ventures LLC. Total consideration was $206,780. Nelson Tressler and Michael Zobrist of Newmark Grubb Knight Frank represented the lessor; Matthew Nelson of J.A. Kennedy Real Estate Co. represented the lessee. • TIMM Productions LLC, dba Meepleville Board Game Cafe, leased 2,758 square feet of retail space at 4704 W. Sahara Ave, Suite 2, from Sahara 3D, LLC. Total consideration for the 36-month lease was $107,511. Nelson Tressler and Michael Zobrist of Newmark Grubb Knight Frank represented the lessor; Jason Rosenberg of Realty Executives represented the lessee. • Cargill Enterprises LLC, dba The UPS Store, leased 1,360 square feet of retail space at 4616 W. Sahara Ave, Suite 1, from Sahara 3D, LLC. Total consideration for the 60-month deal was $144,488. Nelson Tressler and Michael Zobrist of Newmark Grubb Knight Frank represented the lessor. • Vegas Valley Fleet & Auto leased 15,525 square feet of industrial space for 36 months at 5375 Procyon St., Suite 102, from Valley View Hacienda Business Park II LLC. Ben Millis and Chris Beets of Newmark Grubb Knight Frank represented the lessor; Richard Lybbert of Summit Commercial represented the lessee. • Solar Contract Carpet of Las Vegas Inc. leased 19,856 square feet of industrial space for 62 months at 5375 Procyon St., Suite 108, from Valley View Hacienda Business Park II LLC. Ben Millis and Chris Beets of Newmark Grubb Knight Frank represented the lessor; Karolina Rafie of Albright Callister & Associates represented the lessee. • INVIEW Labs Ltd. leased 5,442 square feet of office space at 9225 W. Flamingo Rd., Suite 130, in Las Vegas. Chris Connell and Grant Traub of Colliers International represented the seller, West Flamingo Road, LLC. Ryan Martin, Taber Thill and Patti Dillon of Colliers International represented the lessee. • The Butcher’s Choice of Nevada leased 2,866 square feet of industrial space in Patrick Airport Center at 6045 Harrison Dr., Suite 1, in Las Vegas. Dean Willmore, Mike DeLew and Greg Pancirov represented the lessor, Stockbridge Patrick and Mojave LLC. • Advent Cleaners LLC leased 1,200 square feet of retail space in Siena Town Center at 10080 W. Tropicana Ave., Suite 162, in Las Vegas. Chris Connell, Grant Traub and David Grant of Colliers International represented the lessor, Siena Town Center LLC. • Las Vegas En Tu Idiomia LLC leased 953 square feet of office space at 4045 S. Spencer St., Suite 320, in Las Vegas. Renae Russo of Colliers International represented the lessee.